Networking equipment. Cabling. Maintenance. Energy. Floor space. Everywhere you look, Optical LAN saves both capital and operating expenditure. 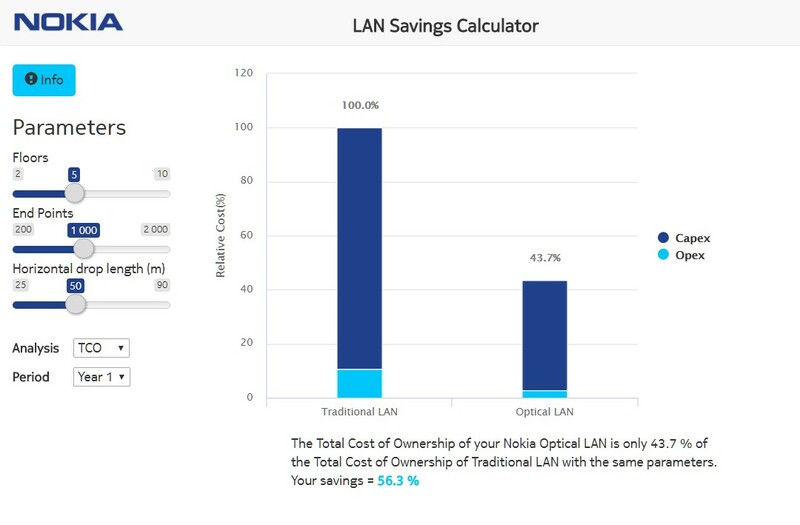 Use the Nokia LAN Savings Calculator to compare costs for a traditional Ethernet-over-copper LAN versus an Optical LAN. Streamline operations by converging all services onto one simple, centrally managed LAN. Cut energy consumption with passive equipment that needs no power or cooling. Free up office space by deploying smaller and more efficient networking equipment. Decrease cabling costs by replacing bulky copper bundles with simple, space-saving fiber. Get value for 50+ years by investing in a future-proof, scalable, fiber-based LAN. You’ll be amazed at the difference Optical LAN can make! Input some basic facts about your LAN coverage requirements – floors, end-points and cabling – and discover the total cost of ownership as well as CAPEX and OPEX savings for five key criteria.